Ms. Caroline Jorant is President of SDRI Consulting which is focused on international relations in the energy sector with a special emphasis on nuclear energy. She began her career working for the French government in charge of the coordination of the national positions in relation with the Euratom Treaty. Ms. Jorant spent 13 years with the French nuclear industry, first with COGEMA and then with AREVA, as the Director for Non-proliferation and International Institutions until 2010. Prior to that, she was appointed as the French representative to the Atomic Questions Group in the EU Council and worked at the French Permanent Representation to the EU (1992-1997). Ms. Jorant was also in charge of developing the nuclear strategy for CEA Industrie and at the International Department of the Commissariat à l’Energie Atomique, a research agency, where she was in charge of the cooperation with European states or research agencies. 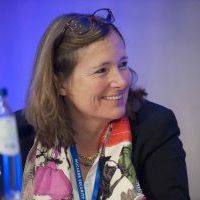 Ms. Jorant has been appointed several times to serve on the Advisory Committee of the Euratom Supply Agency (1999/2008), and she was appointed by the Director General of the International Atomic Energy Agency to be a member of the Standing Advisory Group on Safeguards Implementation (2007/2010). Ms. Jorant graduated from Sciences Po Paris and INALCO (Chinese) Paris and received a M.A. from Johns Hopkins University in International Relations.